As you probably know, I released my Bangkok Guide a few weeks back. I’m getting great responses … and it’s really meant as the single tool that helps you navigate Bangkok’s nightlife. So, anything in regards to location, you can find using my Bangkok Guide. Guest-Friendly hotels, red light districts, bars, freelancer spots, etc. etc. But maybe you also wanna know, for example, where to get your SIM card when you arrive in Bangkok, how to use the train system, and lots of other things. This video is meant to offer guidance, help you save time … and money. Let’s start where it all begins, the airport. You’ve just arrived, went through immigration, customs & now what? WTF now? No worries, I got you covered. 2 Things you want to take care of before going anywhere: SIM card & exchanging money. 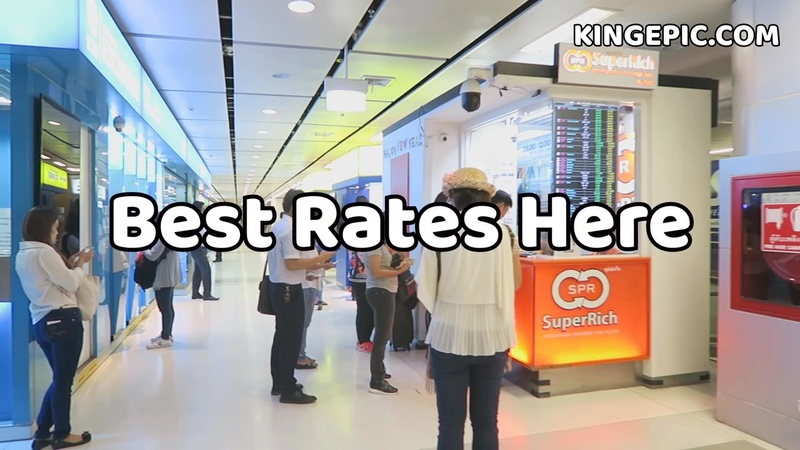 SuperRich offers the best rates. It’s right next to the Airport Train entrance (bottom floor). There many money exchange booths on almost every floor, but they’re not all made equal. I checked the conversion rate of every single one of them & except for the ones on the bottom floor (see video) all offer a poor rate. So, you definitely want to make your way to the area I point out in the video. In terms of getting a SIM card, there isn’t much difference between the carriers – just go the the booth that has the least amount of people waiting in line. Now it’s time to leave the airport & one of the easiest & most inexpensive ways to do that is taking the Airport Rail link. But wait a second, let me show you the bus & taxis departure … in case you wanna take the taxi or you are going to Pattaya by bus. Alright, back to the Airport Rail Link – the train to central Bangkok. Head down to the bottom floor and get a ticket to Makkasan. Have a look at the map on the display & you see the M symbol. That symbol means MRT, the underground trains systems. The station you exit the airport rail link is where you can connect to the MRT, which is the train for central Bangkok. From here, you can continue using the train, or taxis … or whatever. Hell, it really depends on where you are going, e.g. where your hotel is location. Taxis are super cheap and start at 35 Baht. For stopping a taxi, you simple stand close to the street & give this gesture. Any taxi that has the light on is free. Insist on using the meter, some will make ridiculous offers, sometime like 200 Baht fixed price for a ride that would only cost 80 Baht on the meter. And that’s pretty much it. Once you’ve settled in to your hotel, you’ve taken care of the essentials. For your most basic needs, you find 7-Eleven … well, they’re hard to miss. They are everywhere. Snacks, topping up your phone, making flight payments, etc. And for anything else, you simply resort to using my Bangkok guide on your phone. That’s the beauty of it. You can use it on the go & get exact direction to wherever you want to go. Oh, and should there be a question that is not covered by this video, or my guide, you simply shot me an email because my Bangkok guide comes with unlimited email support for exactly those instances.